No one wants to miss out on a successful real estate sale. Missed opportunities lead to reduced cash flow for sellers and agents. There are a number of misconceptions regarding the VA mortgage that cause real estate agents and sellers to shy away from buyers wanting to use their VA benefit. Some even reject offers from qualified VA buyers simply because they wish to use a VA home loan. Don’t let common misconceptions on the VA home loan turn into a missed opportunity. There are several misconceptions about VA home loan that are outdated or flat-out wrong. It’s important for agents to take another look at the VA mortgage as an efficient, simple process that works for nearly all qualified home buyers. Before we address these misconceptions, let’s touch on a few VA mortgage basics. First, in order to be able to use their VA mortgage benefit, an individual must meet certain eligibility requirements. Second, The VA guarantees the mortgage, but they don’t loan the money themselves. A service member works with a lender to obtain a home loan, and then the VA will back that mortgage. The VA has established specific guidelines that lenders must follow, and most lenders have their own set of guidelines on top of the VA’s to ensure each veteran is financially qualified. Finally, the key benefits of the VA loan include 100 percent financing (no down payment required), no private mortgage insurance (PMI), lower credit score requirements and the ability to use the benefit multiple times. In the past this may have been a trend, but the entire process has become streamlined and more efficient. It becomes an even smoother process when the borrower works with a VA specialized mortgage company whose primary focus is on the VA loan. By becoming a type of subject matter expert on VA guidelines, a VA-specific lender can shorten the closing timetable, resulting in competition with conventional closing timeframes, many closing within 30-45 days of contract. This misconception likely arises from the lower credit score required to qualify for a VA mortgage. What many with this point of view overlook are the other requirements to become pre-approved. Not only does a service member have to meet guidelines, they also have to meet their lender’s internal guidelines which are often more strict. Only service members that meet both VA and lender guidelines become pre-approved. This additional scrutiny may result in a more reliable borrower. In addition, many VA borrowers use the VA mortgage not because it’s their only option, but because it offers them the most benefit. Further, even though a VA mortgage doesn’t require a down payment, the rate of foreclosure on VA backed loans is very low. There are plenty of “horror stories” out there of appraisals gone bad. But here’s the important question – is a home really worth the contract price if a number of serious fixes are discovered and will be required shortly after purchase? The VA has established a number of minimum property requirements (MPRs) outlined in Chapter 12 of VA Pamphlet 26-7. The main purpose of these MPRs is to protect the veteran service member by ensuring the home will not require any major repairs before the buyer can safely inhabit the home. The key concept is that the home is move-in ready. That doesn’t mean the home has to be brand new, or in immaculate condition – it just needs to be safe, sanitary and marketable. I’ve personally closed a number of loans on short sales, foreclosures and very old properties that were not in immaculate condition, but they did all share one common trait: they were safe. The VA released its 2012 fiscal year benefits report earlier this year. The section on the VA loan guarantee had some pretty amazing stats. In 2012 the average loan amount guaranteed was $220,838. In many areas of the country that loan amount can get a fairly substantial home. Therefore it’s wrong to assume that a buyer wanting to use their VA benefit won’t be worth your time or they won’t qualify for the amount they’ve offered. The VA mortgage guarantee is much more diverse than this. VA mortgages can be used for a wide variety of property types from new construction, condominiums, fourplexes and modular homes, to name a few. There is a requirement that the veteran intends to occupy the home as their primary residence, but that doesn’t substantially limit housing options. So long as the buyer qualifies for the mortgage amount, a veteran can use his benefit to purchase a fourplex, occupy one of the units and rent the other three. 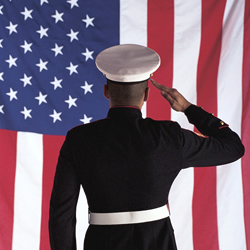 A veteran can also purchase a condominium. Condos have to be approved by the VA, but if the condo association is willing to do the paperwork they can request approval, if they haven’t already. You can check out a searchable list of current approved condominiums on the VA web portal. As a real estate agent you want to look out for your client’s best interests. By making assumptions or believing these common misconceptions, you may be missing out on opportunities for a sale. Don’t let a past VA loan experience or the word of others make you shy away from all VA mortgages. In this tough economic environment, it’s worth it to reconsider VA mortgages and be open to buyers wanting to use them. Samantha Reeves is the Senior Mortgage and Homebuying writer for Veterans United Home Loans, one of the nation’s leading financial services providers for service members and their families. A former mortgage loan originator, Samantha enjoys educating others about the VA mortgage process on the Veterans United Network of blogs and social media. Tweet her @Samantha_VUHL or on Google+. I have talked to a lot of people who think they need like, some kind of Kardashian dream home for a VA mortgage. Thanks for helping to clear up a lot of misconceptions, you clearly know your stuff!